Some of you might think this post is really silly. I almost didn’t write it because I figured most of you already knew about this little picture hanging hack. Then I remembered that it wasn’t until a few months ago that I figured this little trick out. Honestly, I wish I had known about it years ago. Oh the time and nail holes I could have saved. I figured if I didn’t know this information until recently, then some of you may not either. 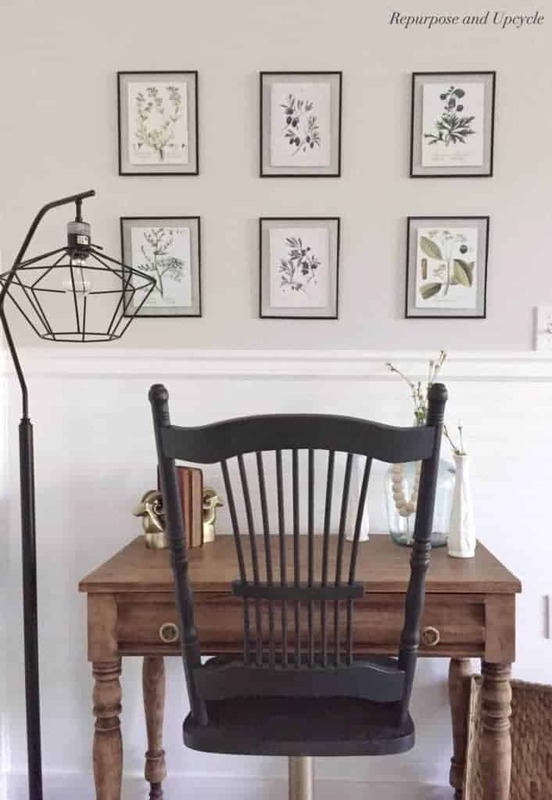 So let me share with you two easy picture hanging hacks; one about how to hang multiple pictures evenly and the other on how to hang pictures with a double hook. Do you know that we just moved? This move has been long but this week I’ve finally started to feel like I’m settling in. When I feel unsettled in a space it helps when I can create or “recreate” a room. I haven’t wanted to rush the “nesting” process and add too many holes in the walls if they weren’t going to be semi permanent. One of the first few spaces I decided to create was in our dining nook and on my office wall. 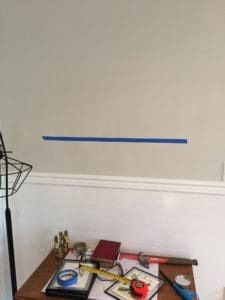 Let me start by explaining the first picture hanging hack with Painters Tape. Before I get to the details I’ll share my YouTube video for those of you who would prefer to watch the process rather than read about it. I hope that was a straight forward video on how to hang four pictures evenly in a square AND how to hang a double hook picture. If you’re not into video’s let me share the process below. 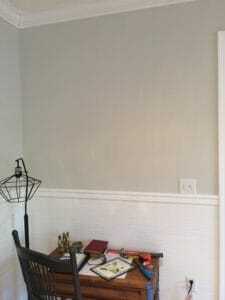 Start with a blank wall and figure out about where you want your pictures to hang. 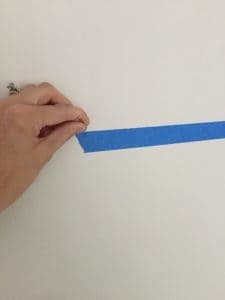 Take a piece of painters tape and stick it to the wall in the center of where you want the first set of pictures to sit. 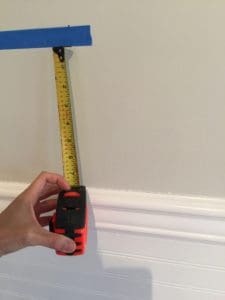 Measure to make sure the painters tape is centered and level. 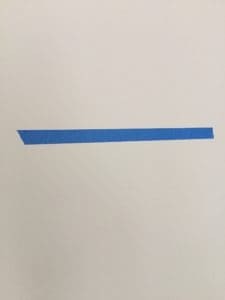 After you’ve added your painters tape to where you want the first set of pictures to be, start by adding a second row on top. Once again measure and make sure it’s level. We want the set of pictures to be perfectly even. 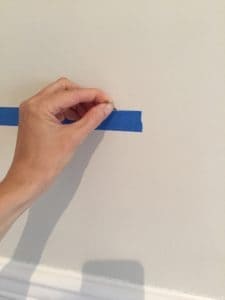 Add a nail or screw right above the painters tape where you want to hang your picture. Repeat this step for however many pictures you need to hang. Once you’ve added your nails to the wall, remove the tape and hang your pictures! Step back and admire how straight and level your pictures look with this new picture hanging hack. Now it’s time for Picture hanging hack number two. This trick is about how to hang a double hook picture frame evenly. Before I knew about this trick I added string to all my double hooked pictures just because I couldn’t stand to try to hang them evenly. I’ll make this quick and simple. 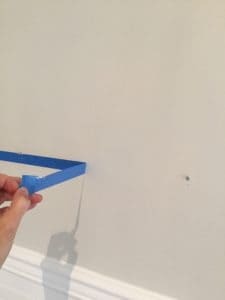 Lay your painters tape over the hooks like you see in the picture above. Make each end of the tape stop where you want the nail to be. 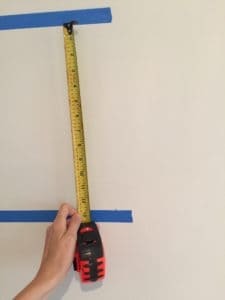 Remove the tape and place it on the wall where you want your picture to hang. 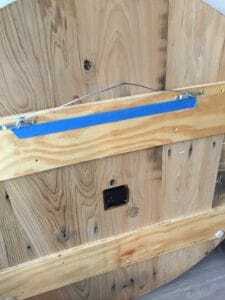 Place your nail or screw on the end of the blue tape. Then remove the tape and hang your picture! What do y’all think? These tricks saved me so much time and guesswork. I hope it helps y’all too! 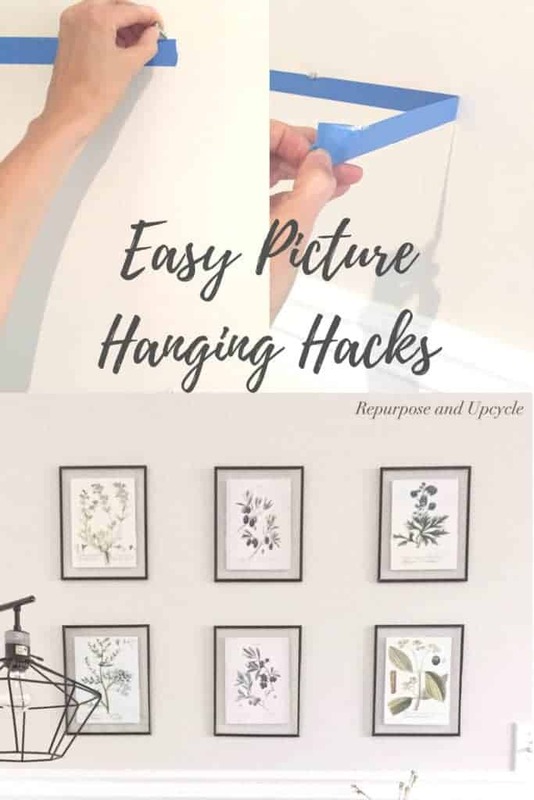 If you know of any other picture hanging hacks, please feel free to enlighten me with a comment below. I’m all about sharing ideas! 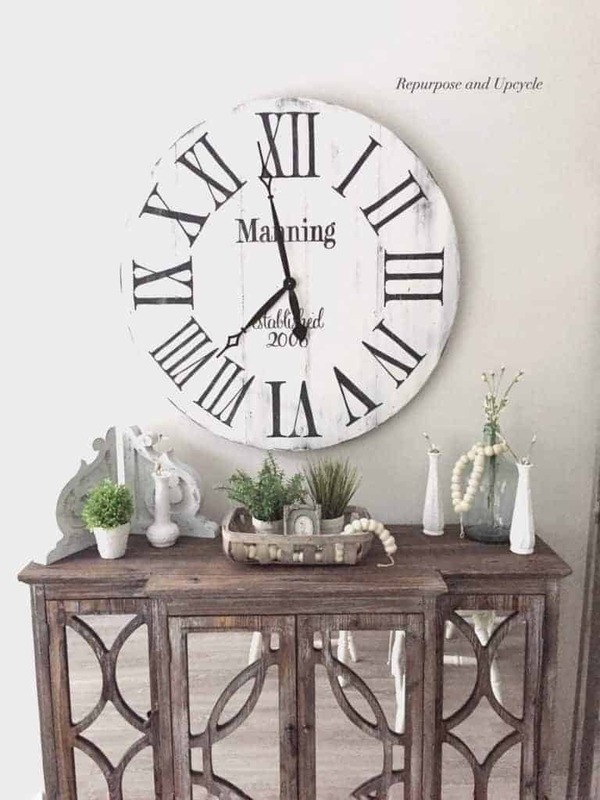 You can see more of this side buffet and clock and my rustic beach cottage dining room with all decor sources HERE. If you liked the botanical prints head on over to my DIY framed botanical prints with free printables HERE. If you liked the vintage desk under the botanical prints, you can see how I stripped the wood on this beauty HERE. If you liked the modern vintage chair with the desk, you can see how I transformed it with only spray paint HERE. I use the same hack to hang pictures too! It’s so much easier than trying to eyeball it and a lot less holes too. Thanks for sharing on Merry Monday. Pinned. I think that this is brilliant. I usually use toothpaste to mark where I want the hole to be but this seems like it would work so much better! Thanks Kate! I’m headed over to share it now. I can’t stand pictures that are crooked, and I’m pretty good at eyeballing it, but it usually takes several holes to get it right. LOL I’ll definitely be using this hack! Pinning, too. 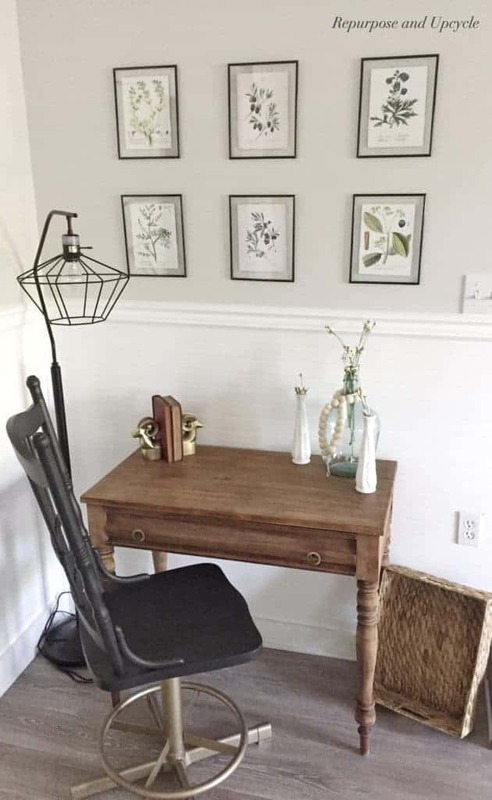 This is a great post for people who want to hang pictures!! Thanks for sharing it at our Cooking and Crafting with J&J. How do you deal with the fact that most of the double hooks are not level? that’s a tough one…..I haven’t had enough of an issue with them not being level to where I had drill new holes. If you have any tips I’m all ears! Thanks for stopping by Jean! And you are so right about the two hooks being more sturdy. Thanks for sharing these great hanging tips with SYC. That second hack is genius and I can’t believe I didn’t think of it when I was struggled to hang a couple of canvases recently. I certainly know for future! Great tips, thanks! We moved in November, and I STILL don’t have much on the walls, because I’m so afraid to put those nails in the walls! Stopped by from Strawberry Butterscotch. I totally get it, that’s why this hack is so awesome! I buy a lot of thrifted frames; they often have no picture hanger on the back. I HATE fractions (I think the only time I willingly use fractions is when I am doubling a cooky recipe!). I found the easiest way to find the center of a small frame is to line a straightedge of scrap paper along the top, score where the frame ends with a fingernail, then fold the paper in half from end to score line. That fold line is the center of the frame! For a larger frame, string works well. Make a pencil mark, then center your picture hanger on that line, and voila, a centered hanger. I recently figured out that if I hang a picture that has wire as its hanger that I can hang the picture on the nail, level it, then grab each side of the frame and pull down gently. It creases the wire so that it more likely to hang straight! These are great tips, thank you for the info! I hope you have a great week and thanks for stopping by. So simple and so awesome. I am going to remember these tips for next time I hang pictures. Great ideas! I do have a few pictures with multiple holes behind them…. this would have come in handy. Thanks so much for sharing with us at the Summer Time Fun party. Pinned. These are great tips, and I sure wish I’d had them a few months ago when I was hanging a group of six prints in a guest bedroom! It took me forever to get those hung. I’ll be pinning this for future reference! Can you tell me what paint color you used in your office space? These tips are very much useful in hanging the picture in short time as this helps in hanging picture very quick as a person not getting enough time to carry out such task will surely be helped by the art installers. In case you need any help then check out art services provider in LA for free guidance and project reviews.